Never Before Released Uncut Sheets of Ask Alexander and Erdnaseum Playing Cards! As a special treat for Halloween, we are releasing uncut sheets of a number of our decks for sale for a limited time! These are what the cards look like before they are cut and work great as display pieces or for other purposes. We had the Erdnaseum sheets, for example, at the Erdnaseum convention and there were a number of people getting them signed by all of the attendees, so a good idea might be to have a sheet signed by your favorite practitioners of Erdnase! We have had a limited number of the sheets printed, and have already given away a lot of our stock of the Erdnaseum sheets to attendees of the convention, so act quickly. They will not be reprinted. Additionally we still have a very limited number of our previously released uncut sheets and Ask Alexander playing card decks so feel free to add to your order! The Erdnaseum uncut sheets are available in Cambric. 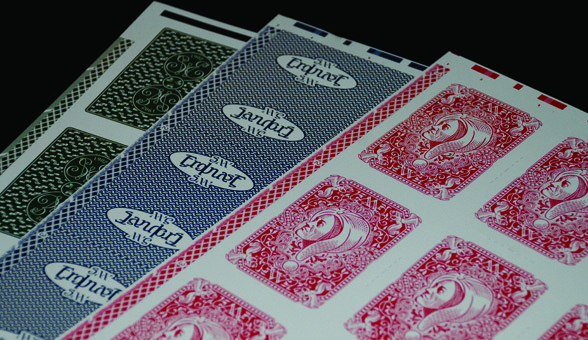 However, the Ask Alexander uncut sheets are available in both Cambric and Ivory finishes. Please contact us if you have any questions or have trouble ordering through the website.